Over the weekend, The Husband took me to our local Penzeys so I could stock up on some necessities. I'd been a little worried about taking my wheelchair into such a little shop, but there was enough floorspace available for me to get around and find all the things I was looking for without knocking down racks of merchandise. I had two coupons so the Northwoods Seasoning ($3.39) and the Herbes de Provence blend ($2.39) were free. Yays! My co-workers apparently find my book-borrowing habits fairly fascinating so (hopefully) this will give them plenty to talk about. You can still follow the live streaming video of the event, or, if you're on Twitter, search for the hash tag #TEDxOilSpill or follow TEDxOilSpill. (I presume the talks will be archived and made available at some later point. I'd really like to listen to portions of it, again). The morning after his sixtieth birthday party, Silas Kane is found dead at the foot of a cliff. His death, which appears accidental, comes as a relief to both his principle heir and his business partners -- his heir will get the money he so badly needs to keep his selfish, grasping wife happy and the partners will get to go ahead with the Australian scheme Silas had rejected. Then the heir is found shot in his study and his heir is the victim of a series of accidents ... can Superintendent Hannasyde get to the bottom of things before another Kane dies? 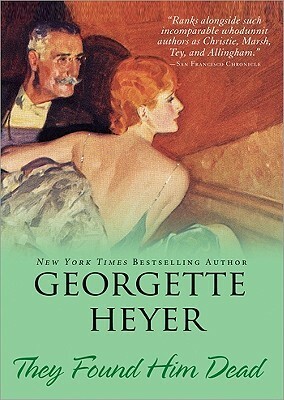 I think I've read too many of Georgette Heyer's mysteries, because they are beginning to lose their charm. 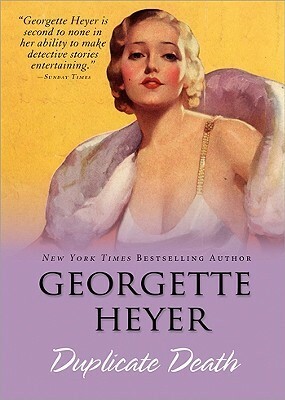 Many of Heyer's characters are simply unlikeable and the mysteries are easy enough to solve. In the case of They Found Him Dead, it was an obvious case of misdirection and finger pointing. "It seems to me it is about time I got rid of you. All things considered." One foggy evening, Mr. Frank Amberly, barrister in criminal law, comes across a woman standing by a car in a back country lane. It turns out the woman has a gun and the car contains a dead man. Rather than be unduly alarmed, Amberly decides the woman couldn't have done it, exchanges barbs with her, and then motors off into the night. When Amberley does inform the police, he conveniently neglects to mention the woman's presence. And, while he grudgingly assists the police in their investigation, it is obvious he's only doing so because it suits his own purpose. I wanted to like Why Shoot a Butler? but (as with They Found Him Dead) I solved the mystery almost immediately and the characters were not interesting or original enough to keep my interest. Really, I felt as if I had encountered most of the characters before with different names in previous Heyer mysteries. The romance between Amberly and the mysterious Brown was also predictable and uninteresting -- from the moment they first sniped at each other, I knew they were going to fall in love. Unfortunately, there was no sense of suppressed romance and I could just as easily seen them become implacable enemies. The air is full of perfume and blithe birds' lay. Think this is funny? You might want to read Stuart McMillen's Amusing Ourselves to Death (Aldous Huxley versus George Orwell). Mrs. Haddington, a widow of mysterious provenance and wealth, hosts a duplicate Bridge party at her London residence and one of her guests is murdered -- strangled with length of picture wire. Chief Inspector Hemingway of Scotland Yard is soon on the scene, making enquiries and forming opinions which might, it turns out be the wrong ones when there is another murder -- seemingly identical to the first! Duplicate Death is a fast paced mystery with lots of red herrings and odious characters I just loved to loathe. 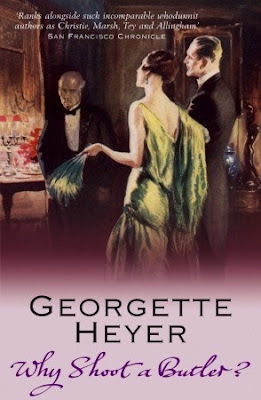 Indeed, I don't know what's going on with Heyer's mysteries, but every one I have read thus far contains the most terrible characters. Not that I mind very much as, frequently, wickedness and wit seem to go hand in hand! Those who disliked her said that she was wholly devoid of intellect, but this was unjust. Whenever she had a few minutes to spare between her various engagements she would turn over the pages of society journals, even reading the captions under the pictures; and she never entered her bedroom without turning on the radio. Also, being a nerd, I trying to translate Inspector Grant's Scot-isms using a Scots-English dictionary, but was largely unsuccessful.